This is a database conversion to allow easy browsing of Aoki's excellent Bi Newsletter shortwave transmission database, helping you find quickly and easily the broadcast schedule for any shortwave radio transmission. In addition, it shows the technical details for the transmitter, including geographic location, transmitting power and distance from your current location. Click here for a picture explanation. Please allow your browser to report location when prompted in order to calculate the distance to each transmitter. Let's say you wish to see the complete broadcasting schedule for a specific station. Choose your desired station from the list located in the first box and you'll see how many frequencies of that station are currently online, followed by the complete broadcast schedule. The list is sorted by the station's name. Example: you want to get the BBC schedule. Choose "BBC" from the first or second list and press "go" if the page does not load automatically. As there are a lot of shortwave radio stations (exactly 879 registered shortwave stations in the winter 2011 schedule), the list in the second box allows you to quickly choose only from the top 40 stations according to the number of daily broadcasts. Again, the list is sorted by name. The number in parantheses shows the number of daily broadcasts for that specific station: BBC has 349 broadcasts, Deutsche Welle has 71 broadcasts, etc. If there are other stations broadcasting on the same frequency, you'll see an yellow or red warning next to the frequency value. 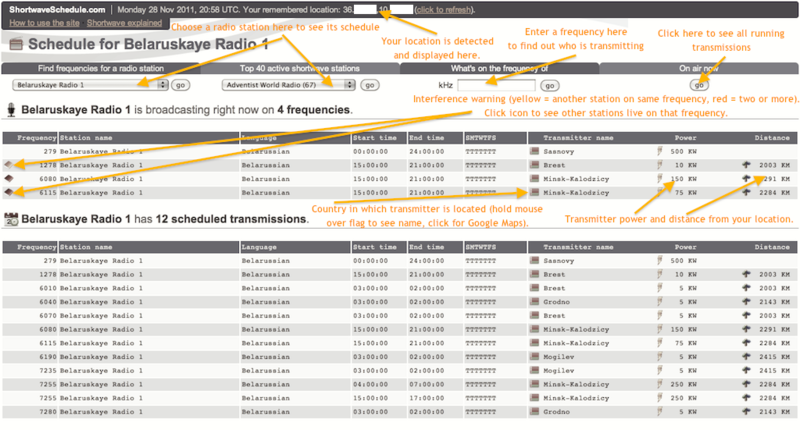 Click the icon to see all stations currently broadcasting on that frequency. Just as information: China Radio International is the most active shortwave radio station with 846 daily broadcasts, while the most powerful transmitters have 2000 kilowatts of power (Felsberg in Germany, Beidweiler in Luxembourg, Solt in Hungary and Duba in Saudi Arabia). Let's say you have found a transmission on a specific shortwave frequency and want to know what radio station it might be. Just enter in the kHz box the frequency you're interested in and you will get a list of all radio stations broadcasting on that frequency. To make this feature even easier to use, the cursor will be automatically positioned in the kHz field after the page is loaded (like Google does for their homepage), so you can simply type the frequency and press Enter on your keyboard. Example: enter 15710 kHz in the frequency box, press Enter or the "go" button and you'll see China Radio, KTWR Guam, Radio Exterior de Espana, Radio Romania International, Radio France International and Radio Riyadh are broadcasting on 15710 kHz at certain times and days. If there are any transmissions online, they will be listed right after the search form. Just click the button to get a list of all currently running broadcasts in the world (the time and day are taken into consideration when checking). The transmission list is presented as a table showing the frequency, station name, broadcast language, start/end times and the active days (week starts on Sunday, therefore SMTWTFS is Sunday, Monday, Tuesday, Wednesday, Thursday, Friday and Saturday). A value of "F" in the day column stands for "false", meaning the station is not broadcasting in that day; "T" is "true". In the transmitter details column you'll find a small flag next to the transmitter name, showing the country in which the transmitter is located. Clicking the flag will open a new browser window with Google Maps centered on the approximate transmitter location. Next you have the power of the transmitter in kilowatts (for sites with multiple transmitting powers, the transmitter details are separated, so you'll know if the frequency you are receiving is from the weak or powerful station). If your browser supports geolocation functions (HTML 5 feature which is available in Firefox 3.5, Opera 10.60 and Safari/Chrome/Webkit 5|5|533 or newer; Internet Explorer not supported at the moment), you will see the site tries to detect your geographical location (where in the world you're located). If this is detected successfully, the "distance" column will show how far the transmitter is from you (in kilometers). The top bar will always show the UTC (Universal Time Clock) time and your currently detected location, with a link to refresh your position.